We lost the last generation to healthy nutrition before they were 18 months old. Parents found their children rejecting baby foods. And they didn’t know what or how to feed the babies they loved. They didn’t want their kids to go hungry. So the finger foods that many kids sampled were salty, partially hydrogenated, artificially colored, white-flour crackers, sugary sweets, and sippy cups of flavored high-fructose corn syrup drinks. The babies would take these without protest! By mainlining these artificially concentrated flavors to their taste buds, we took away kids’ ability to exult in the gentler rainbow of flavors in fruits, vegetables, and healthy grain products. Fruits and vegetablesdropped from their diets. Many parents thought it would be easier to get them to eat veggies when they were older. Not so. The habits were ingrained for the short run and the long haul. We gave them a blueprint for failure, both for the foods they would want and for how their bodies would store and use those foods. When your baby is in the stage of exploring by carelessly putting almost anything from bits of fuzzy lint to slow-moving spiders in his mouth, that’s the moment to supply him with a variety of healthy options–not things you try to coax him to eat, but things he can discover, mouth, and enjoy. He is primed for variety more than at any other time in life. But variety on his terms. This is a great age to turn the high chair into a treasure map. For many kids, the best way to do this is with a muffin or ice cube tray. Each slot can hold a few tasty, bite-sized treasures. You might want to cover some or all of the treasures with a napkin or a cloth. Or hide the peaches under a layer of pears. I like using one or two of the cups for a dipping sauce. Applesauce, yogurt, or pureed baby fruits and vegetables are all good choices. Other cups might contain sweet potato cubes (easy to steam or microwave), diced pears, small half-slices of bananas, half-medallions of soft-cooked carrots, diced soft-cooked green beans, shredded apple, diced kiwi, shredded carrot, small pieces of cheese, diced avocado, quartered grapes, diced peaches, bite-sized pieces of wheat toast, or oat cereal. Imagine all of the possible combinations! You might want to share one (or more) treasure map meal with your baby to demonstrate how dipping is done. He might like cheese in applesauce, carrots in smushed peas, or peaches in yogurt. He might just put his fingers in the applesauce and make a mess. He might try combinations you would reject. That’s okay. 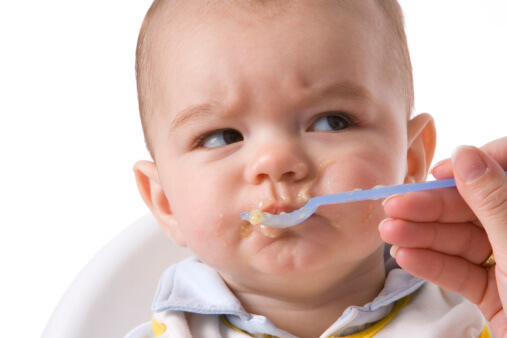 Some babies love it if you name the things they are eating. You will want to use portions that you are comfortable tossing, storing, or reusing in another way. Let him set the amount he eats. As long as he and the options are healthy, don’t try to get him to eat more or less. And let him select from among the options which he prefers right now. Be sure to provide at least some veggie, fruit, and grain options. If he is going only for the grains and not the veggies, increase the number and variety of veggie cups in the future, and decrease the number and variety of grain choices. The foods you offer should dissolve easily in the mouth (like cereals) or be soft (like bananas), cooked (like carrots, peas, or spinach), or shredded (like apples) to make them easy to swallow. Apples can also be cooked. Cut them into cubes or strips and pop them in a microwave for three minutes or so. You may want to dust them with cinnamon first. When they cool, they are a delicious finger food. They don’t need any added sugar. Even without it, they are sweet enough to be a yummy dessert.